Implicit, explicit - no point in splitting hairs with you about what you take away from my post. You did start off yours by saying you see things opposite from me and then concluded by saying what I quoted. Now perhaps I read too much in what you implicitly said, but I took that to mean your opposition to my suggestion to move him outside was based on the fact that the Rams don't need another pass rusher opposite Fowler, but need a run stuffer. Frankly, I didn't get from your post that you disagreed with whether they ought to move him outside, only that you thought they'd probably only, at most, move him to replace Barron. And in the spirit of agreement, I also agree that in all likelihood he doesn't get moved outside, if anywhere. But, that doesn't change the fact that through my fan-based rose-coloured glasses I think he's shown better instinct/aptitude at the OLB/DE position (he can contain, split a gap, and cover somewhat). Keeping him at either of the ILB spots doesn't inspire me unless they go find someone else to significantly bolster the middle. For me, he's nothing more than JLau 2.0 - serviceable but never domineering. I really hate for these posts to go on too long, attention spans of most of us don't seem to be what they once were. Now it's clear we both agree they need help up the middle. How they go about it is another thing. Again, I don't disagree they probably will not move him outside, I'm only suggesting they should (and alas we know how much value management places on Professional Fan opinions ...). Looks like an excellent and viable candidate Maui. Below, excerpt from a Dec. 5, 2017 AP / ESPN article. Kiser has already earned his degree in foreign affairs with a 3.42 grade-point average. He is currently working on a master's in higher education. He is also one of the best linebackers in the country, leading the ACC in tackles with 134. Maybe Kiser is ready to step into a bigger role. Maybe Kiser will turn into the thumper we haven't had since London Fletcher .. One can hope ..
After the ending the week early in Mobile for the Reese’s Senior Bowl, former Virginia inside linebacker Micah Kiser wanted a strong showing at the NFL Scouting Combine. The Academic Heisman winner did just that. Because his surgically repaired thumb is still not 100-percent, Kiser didn’t participate in the bench press portion of the testing with the linebackers. The former Gilman standout did everything else, however, and was a top performer according to NFL.com in the board jump, posting 121.0 inches, finishing eighth (out of 31) among linebackers. Kiser was also a top performer in the three-cone, posting 7.05 seconds, finishing tenth. He was also a top performer in the 20-yard shuttle, finishing a time of 4.24 seconds, which ranked him fifth among linebackers. 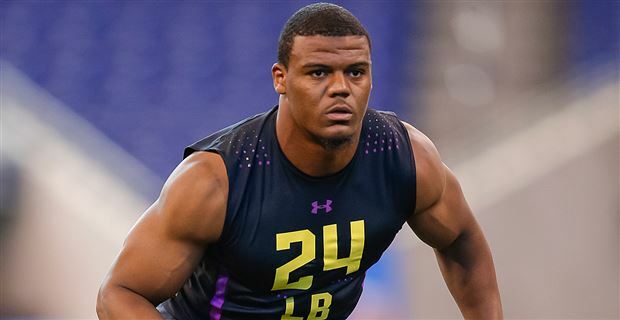 Kiser, measured in at 6-foot-2 and 238-pounds, ran faster than expected in the 40-yard dash with a 4.66, finishing 15th among the linebackers. He also posted a 35.5 inch vertical, which placed him eleventh among the linebackers in attendance. The leader in the ACC in tackles for the last three seasons will have his next opportunity to impress NFL scouts ahead of the NFL Draft at UVA’s Pro Day tomorrow and he’s looking to build on that showing in Indianapolis two weeks ago. No, not that I could tell, but hey it's your post, you tell me. When you typed "penetrate gaps and curl the edge", it sounds like you think he'll excel at rushing the passer. Which is fine. Outside backers in a 3-4 have outside contain and pass rush responsibilities. You think he'll be better suited for olb/de... and say he should be moved there. I only disagree that instead of moving him to olb, that they will likely move him to Barron's spot. Clearly we both agree a better run stuffing lb is needed in the middle. If you look at what is going on around the league, you will see it is market value for a player of his level and potential at that position. And it's just one year. Very rational move for a player who has already shown his impact on the D in Phillips scheme. Edge threat in the 3-4 is a must have. I agree. No argument here. .. but they also need to stop the run. Getting to the qb means nothing if you're getting gashed up the middle. Isn't that part of my point of moving him to OLB/DE ... he was practically worthless at patrolling the middle ... put him where he's more productive ... and then find some meaningful help at MLB/ILB via trade or FAgency. And while we are talking about run support, I'm still good with replacing both Suh and Brockli as anyone else can simply eat up the space they did in the regular season. I see Kiser as an ILB more than an OLB, but he's certainly worthy of watching. Fox is more of a rotational DE in my mind, but he was very efficient prior to his injury. I'm really curious about Franklin-Meyers. He made some nice plays in a rotational role last season. I don't think we're going to have a shot at the top edge guys in this draft unless someone like Polite drops, but that could be a red flag. Unless the Rams trade back to add picks on day 2, I see their emphasis on the d-backfield and O-line which syncs with their position at #31. That didn't stop them from installing LittleTon as signal caller last year. Nor should it stop them from installing a new one this year. Clearly, 5 blocks in less than a season and a half and a pro-bowl accolade as a ST player should be evidence enough that the LittleTon is better suited to penetrate gaps and curl the edge as an OLB/DE. Move him there, get an established ILB post-haste, and coach up one of the youngsters for the other one. It was a weaknesses from the get-go. Nothing last season proved me wrong. And if there is any surprise thus far, it's the fact that LBs are moving fast, and the FO seems to be stuck in reverse on this upgrade. I actually see things opposite from you. I suspect Littleton will take over Barron's spot and play more of a rover position on the inside and drop back in coverage more, while a more natural run stuffing lb takes over his spot. Ultimately, it all comes down to what's out there. With Ramik unsigned and Barron gone, Rams are short a mike unless Kiser is ready to roll. Who they find may end up deciding where Littleton will go. Sure the Rams need more pass rushing help, but they also need to stop the run. Getting to the qb means nothing if you're getting gashed up the middle. I expect Longacre is out of the picture. In addition to Fowler, Ebukam and Obo, don't forget about Fox, Lawler and Franklin-Meyers. I also see Littleton as a natural OLB/DE, and too tall and lean to be ideal as an ILB. But Littleton likely remains an ILB in 2019 due to his experience/role as defensive "signal caller", and no other experienced ILB to take that over. But this could change after 2019. Ah, I stand corrected. For some reason I was thinking Longacre was signed through this next season. ... But Littleton likely remains an ILB in 2019 due to his experience/role as defensive "signal caller", and no other experienced ILB to take that over. Waaaaaay too much money, but we'll see if he's worth it. It appears that the Rams are willing yearly to hand out 1yr. $14M deals. At least five of the Rams' eight draft picks agreed to terms Thursday. At least three of their four restricted free agents plan to sign their one-year tender offers today. But in terms of unrestricted free agency, there was a lot of talk but no apparent action. After striking quickly to land Philadelphia safety Quentin Mikell on Tuesday, the first day that NFL teams could negotiate with free agents, no other moves have been made, causing some in Rams Nation to become antsy, frustrated, and even angry. But based on the amount of discussion the Rams are having with free agent prospects, it looks like just a matter of time before the Rams add to their roster. • At linebacker, the team has been talking to at least four players, and may be looking for both an outside and inside ‘backer. But one of those candidates went off the board Thursday, when Scott Shanle decided to re-sign with New Orleans. Stewart Bradley of Philadelphia, Zach Diles of Houston, and Ben Leber of Minnesota all remained possibilities, however, as of Thursday evening. • At defensive tackle, the Rams have talked with Justin Bannan, who was released for cap purposes by Denver shortly before the lockout began. Bannan, 32, started all 16 games for the Broncos last season and is considered an upgrade over last year's starter - Gary Gibson. It's not clear at this point if the Rams have any interest in re-signing Gibson. The Rams have expressed some interest in Brandon Mebane of Seattle, but aren't considered a frontrunner for his services. Barry Cofield of the New York Giants seemed like a no-brainer at one time because of his past association with coach Steve Spagnuolo, but Cofield agreed to a contract in Washington worth a reported $36 million over six years. • At running back, the Rams took a pass on Reggie Bush, who was traded Thursday to Miami. And free agent Darren Sproles of San Diego agreed to terms with New Orleans late Thursday. Instead of seriously pursuing those two elite specialty backs, the Rams appear to be targeting a backup to Steven Jackson capable of carrying the load for a couple, three games should Jackson go down with an injury. Jason Snelling of Atlanta and Jerome Harrison of Philadelphia have emerged as candidates. • It has been more difficult to get a read on the offensive guard position. The team talked to Daryn Colledge of Green Bay, but he is headed to Arizona. Leonard Davis of Dallas could be another possibility. • At receiver, the Rams apparently are taking a pass on the big names. They have talked to Atlanta's Brian Finneran, a role player over the years for the Falcons. Free agency being pushed back to April? Gary Myers, of the New York Daily News, reports the NFL free agent market is scheduled to open March 3, but it could be pushed back until April 1 if there is enough progress made in the next couple of weeks in negotiations for an extension of the collective bargaining agreement. There have been advances in some areas since the Super Bowl ended 10 days ago that could lead to a delay in free agency, according to source with knowledge of the talks. The sides met yesterday in New York. "The only good news is there is a lot of talk," the source said last night. "That is usually a good sign. Both sides are feeling pressure to get it done within a reasonable time period." Running back Calvin Middleton of Jacksonville (Ala.) State agrees to terms on free agent contract w/Rams. Two more rookie free agents who have agreed to terms w/Rams: cornerback Jeremy Caldwell, Eastern Kentucky, center T-Bob Hebert, LSU. 3 linebackers have agreed to terms as rookie free agents w/Rams: Sammy Ford, Houston; Noah Keller, Ohio; Alex Hoffman-Ellis, Washington St.
Long is younger brother of former No. 1 overall draft pick Jake Long of Dolphins. Joe won Gene Upshaw award as lineman of year in Div. II. Rams agree to terms with Southern Mississippi quarterback Austin Davis as rookie free agent. Threw for 3,046 yards, 30 TDs last season. Per Welcome to College2Pro.com - NFL Mock Draft, Syracuse offensive tackle Michael Hay has agreed to terms with Rams as undrafted rookie. Rams have agreed to terms on a rookie free agent contract with Oregon State punter John Hekker. I love what the Green Bay Packers have done thus far in free agency. The Packers haven't signed any players in free agency nor have they lost any. The Indianapolis Colts also haven't signed any players. Football is figuring out what baseball discovered in the 1970s – you can't buy a championship. Which is contrary to public perception. There's a frenzy in the fan bases of 32 NFL teams each off-season. Spend. Buy free agents. The bigger the contract, the better the signing. If you're not spending, you're not trying to get better as a football team. The Green Bay Packers haven't panicked in free agency at the thought of Aaron Rodgers or another quarterback in charge. The Cowboys, Cleveland Browns, San Francisco ***** and Seattle Seahawks each signed a free agent to a contract in excess of $39 million last off-season. In addition, the Washington Redskins gave aging middle linebacker London Fletcher a $10 million signing bonus, and the Jacksonville Jaguars gave journeyman offensive tackle Tony Pashos another for $9 million. All the while, the New York Giants were sitting out the spending spree. To borrow a Jerry Jones term, the Giants were "keeping their powder dry." The Giants wound up signing one free agent to fill a specific hole on the depth chart, bottom feeding in late March for linebacker Kawika Mitchell. They gave him a modest one-year, $1 million deal. Mitchell is now wearing a Super Bowl ring – and 2007 multi-millionaires Leonard Davis (Cowboys), Eric Steinbach (Browns), Nate Clements (*****), Patrick Kerney (Seahawks), Fletcher and Pashos are not. In 2006, the Indianapolis Colts signed only one free agent, and he wasn't even a position player – kicker Adam Vinatieri. The Colts wound up winning the Super Bowl. In 2005, the Pittsburgh Steelers also signed only one free agent – wide receiver Cedrick Wilson – to a four-year deal worth less than $10 million. He didn't even start for the Steelers. But guess who won the Super Bowl that year? Free agency never has been and never will be the answer. Teams are realizing the game's best players no longer become free. So the smart teams invest their salary cap dollars in re-signing their own players. Back in the 1990s, you could sign a difference-maker like Reggie White or Deion Sanders in free agency. But with each passing year, the quality of free agents decreases, yet the quantity of the money increases. I had breakfast with an NFL head coach last week, and he shook his head at the fiscal craziness, saying that average players are getting superstar money.